Renowned Swiss watchmaker Longines has introduced a new watch model Longines Tachymeter Chronograph (ref. L2.781.4.13.x) with a tachymeter scale, in the design of which are used elements of traditional classics and the latest trends of the modern watch world. The round case of the model with a diameter of 41 mm is made of stainless steel. On the top and back, the case is equipped with a two-sided anti-reflective sapphire crystal. The watch water-resistant is up to 30 meters. The novelty operates on a manufactory automatic mechanism Calibre L688 with chronograph function, developed based on the ETA A08 L01. The caliber with 13 ¼ lines is collected on the 27 jewels, has a 54-hour power reserve and the carrying frequency of 28,800 vibrations per hour. The functions of the mechanism is the indication of hours, minutes, seconds, date and tachometer scale. The markings on a white lacquered dial are made in the form of Arabic black numerals. On the dial, there are two tachometer scales - blue to measure the velocity in the interval of 1000 feet and red on the interval of 100 meters. Small second’s hand is put to the lateral dial at the 9 o'clock position. Date is built into the aperture at the 4.30 o’clock position. The chronological functions are displayed on a 30-minute indicator at the 3 o'clock position, 12-hour indicator at 6 o'clock position, and by means of the central second’s hand with a pear-shaped tip. Made of blue steel, the central hour and minute hands are decorated at the end with "apples of Breguet." Longines Tachymeter Chronograph (ref. L2.781.4.13.x) watch comes on an elegant black alligator strap with a steel buckle. To buy Longines Tachymeter Chronograph (ref. L2.781.4.13.x) watch will be available through the official representatives of Longines. Official website of Longines watches. Acting as the official timekeeper of FIS Alpine Ski World Cup, the known company Longines held in Lenzerheide the award ceremony of Longines Rising Ski Stars. Correct forms or square time! A little spirit of the seventies with retro effect! Square watch can be described in this words, which increasingly began to appear in the collections of various watch manufacturers. As an official partner and timekeeper of jumping Hong Kong Masters, Longines presents an official watch of the event - Conquest Classic. Longines has signed a new partnership agreement with FEGENTRI - International Association of jockeys. Founded in 1995, the federation has in its list members from 25 countries and its aim is to promote and develop international races for amateur riders. The new model Column-Wheel Monopusher Chronograph, released by the Swiss brand Longines, will be officially presented at the international exhibition Baselworld- 2014 to be held from March 27 to April 3. At first the La Grande Classique de Longines collection was introduced in 1992. Since the models of this line became a symbol of classic elegance of Longines. The company Longines presents a novelty Heritage 1973, which was developed on the base of the watch, released in 1973. The pincushion case of the model with a diameter of 40 mm concludes the L688 mechanism with a column wheel and a 54- hour power reserve. The famous company Longines announces the release of the novelty 1968 Heritage Square, made in 60`s vintage style of the 20th century. The model is produced in two sizes: 26 mm x 26 mm and 33 mm x 33 mm. Commonwealth Games is an international multi-sport event of the Commonwealth of Nations. Competitions are held since 1930 every four years. Known company Longines has pleased its fans with novelties DolceVita. The watch has a rectangular case made of steel or yellow gold. There is also a version in steel and rose gold. Longines has announced a partnership with CSI Basel. Known company Longines in the current year is celebrating the 135 years of presence in the Russian market. The company Longines, the official partner of the 32nd World Championships in Rhythmic Gymnastics in Kiev, Ukrainian athlete Anna Rizatdinova awarded the prize "For elegance." The watch company Longines has released a novelty Avigation Oversize Crown Monopusher Chronograph (Ref. L2.783.4.53). It is made in the style of vintage watches produced in the 20th years of the last century. The new Avigation Oversize Crown GMT watch by the Swiss brand Longines is made in the style of vintage watches produced in the 20th years of the last century. Known company Longines has released a new model Avigation Oversize Crown (Ref. L2.777.4.53), the design of which is made in a vintage style. Swiss watch brand Longines in close cooperation with the company "Time Avenue", serving as a brand partner for 10 years, has opened on Petrovka a new, second in a row, single-brand boutique. The design of the new Asthmometer-Pulsometer Chronograph watch by the company Longines is based on the historical pattern of 1963s, which was intended for medical purposes. From May 30 to June 1 of this year, young athletes will take to the courts of the charity event “Longines Future Tennis Aces”, which is organized by a well-known company Longines. It is an official partner of the French Roland Garros Open Tournament. The famous Swiss watchmaker Longines at the annual exhibition in Basel has unveiled a novelty HydroConquest Chronographs (Ref. L3.696.4.13.6). The watch company Longines at the annual exhibition in Basel has presented a novelty Heritage Military 1938 GMT, the design of which is made in military style. The watch company Longines, which is the official timekeeper of FIS Ski World Cup, awarded the winners Mikaela Shiffrin and Alexis Pinturault with a special prize Longines Rising Ski Stars. 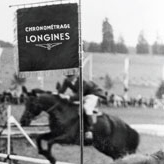 The history of watch brand Longines is closely connected with the events of equestrian sports. Since 1926, it serves as an official partner of numerous competitions: CSIO and the CHIO of Nations Cup and CSIO Barcelona, Dubai Show Jumping Championship in Dubai, President's Cup, etc. The famous watch brand Longines has developed a novelty Conquest Classic Chronograph, which will be officially presented at the annual exhibition BaselWorld 2013. The exhibition will be held from April 25 to May 2, 2013. Swiss brand Longines celebrates its 180th anniversary in Moscow. Friends of the company gathered in the restaurant "Korsch Theatre." Among the guests were Igor Vernick, Maria Mironova and Kirill Serebrennikov. Longines Hong Kong International Races, which were held at Sha Tin Racecourse, became the culmination of the year. This event is one of the world's most prestigious races; the total prize fund is 72 million Hong Kong dollars. 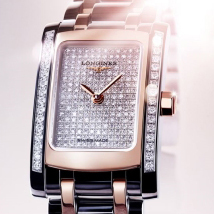 The watch company Longines has introduced a new watch model Ladies Diamond Conquest, released in two versions: ref. L3.281.0.57.7 with black lacquered dial and ref. L3.281.0.87.7 with a white mother of pearl dial. In the current 2012, the Swiss watchmaker Longines is celebrating its 180th anniversary. In honor of this great event, the company has pleased fans of fine mechanics with the new limited edition collection of four luxury models, each of which is represented in a limited number of 180 copies. The famous Swiss company Longines has introduced a new model of wristwatches Avigation Mono-Pusher Chronograph Type A-7, which is a one-button chronograph with a crown, mounted on the case at the 2 o’clock position. As the owner of the rich tradition of sports timekeeping since 1926, the watch company Longines is an official partner of many equestrian competitions - CSIO Nations Cup and the CHIO and CSIO Barcelona, Dubai Show Jumping Championship in Dubai, President's Cup, presented by Longines, and so etc. For several years, the famous Swiss company Longines Prize awards the women engaged in an important activity in a particular area. In early autumn, the racetrack Iffezeheim passed the next Longines Grosser Preis von Baden. Official sponsor of the race is a famous watch brand Longines. Swiss watchmaker Longines, noting the 180th anniversary of the foundation, presents its novelty – a watch Telemeter Chronograph ref L2.780.4.18. Company representatives have noted that the design of the novelty inspired by the Longines chronograph released in 1933. On the occasion of its 180th anniversary, the Swiss watch company Longines, located in the town of Saint-Imier, developed a new elegant and iconic model for travelers. This model is a honorable member of the legendary Conquest collection. This is Longines Conquest 24 hours men's watch, the reference is L3.687.4.56/76/99.6. The watch company Longines has extensive experience in the field of sports timekeeping. Active participation in professional sport is the driving force behind the development of the brand. The well-known watch company Longines officially unveils its new ambassador Simon Baker. Simon is an Australian television and film actor. He is known to viewers of the television series "The Mentalist", in which played a major role. One of his latest film is "Maximum Risk". The company Longines, which is an official partner of the French Roland Garros Championship, is looking for future tennis champions on its tournamen Longines Future Tennis Aces. Founded in 1832 in Saint-Imier, the watchmaker Longines is celebrating in 2012 its 180th anniversary and in honor of the anniversary the brand has introduced two new models of Longines Heritage 1940 and Longines Heritage 1942, which actually are remade versions of the brand’s historic watches. The famous watchmaker Longines has announced its partnership of four rounds of the championship Global Champions Tour in 2012, the first round of which took place in Qatar, in the city of Doha, from 5 to 7 April. Longines - one of the famous Swiss watch companies, offering its fans completely different models of watches. At the world exhibition BaselWorld 2012 the company has introduced a new limited edition watch Column-Wheel Single Push-Piece Chronograph 180th Anniversary Limited Edition. The famous Swiss watch company Longines presents a watch called Agassiz 180th Anniversary Limited Edition, created in honor of the 180th anniversary of the brand, founded by Auguste Agassiz in whose honor is named the model. The famous watch company Longines has presented a new collection created and named in honor of St. Imier. New watches are devoted to place Saint-Imier where this brand was born in 1832 by Auguste Agassiz. The sport collection Conquest of the watch brand Longines has been added with new models that with shiny gems – as probably combine brilliance of diamonds with the strength of ceramics. The Swiss watch brand Longines has pleased watch connoisseurs with the issue of new delights - the new watch model La Grande Classique de Longines L4.241.0.11.2. Bright expressed classic design of the watch symbolizes the elegance and impeccable style.